… for reflection, in the water of Wright’s Pond in the Middlesex Fells. A long trip is nearing its end. I rest in a place that is stunningly beautiful. It is an unexpectedly thought provoking place. The mountains of West Virginia. I have been here before but never during a campaign year. Trump-Pence signs are on many a lawn, as are surprisingly to me, a few Gary Johnson. No Hillary Clinton signs seen so far. As I interact with people here, I can imagine that she would seem quite foreign. I am reminded of the time I sat in an airport near two older ladies watching a television. George W. Bush was on the screen. He spoke but the sound was on mute. One of the ladies said, “I’d invite him to my picnic. I think I’ll vote for him.” Policy and experience were moot. He came across as familiar and likeable. Clinton does not. Yet Trump does? Fascinating. I am in an area that is approximately 96 percent non-Hispanic White according to demographic tables. Without looking up the statistic, I suspected such a number. I stand out quite a bit. People stare whenever I step out of a car, walk across the parking lot, sit in a restaurant. The culture here is a bit different than my recent experience in South Carolina. There, even if you stand out as different, the culture is such that you “throw up a hand” or acknowledge a presence in some way. At least, that’s the way it used to be. Here … people sometimes seem startled when I say hello or look at them and smile in greeting. Some will nod back. Others just stare. At times I felt uncomfortable, and it wasn’t just the Confederate flags peppering various places. The flags were old and tattered. Perhaps those were really about heritage and not about the new symbolism of hate. To go places. To be different. Even if one is not readily welcomed. There is value in that especially in a world where it is too easy to view those who are different, those with whom one has had no personal experience, as … well … those who should be held at bay with walls and exclusionary laws that have been passed in the past and can be again. Because of the various circles I run in for work and pleasure, sometimes people will say to me, “Cynthia, I think you’re the first black person that such-and-such has interacted with.” I have to hope that I am not the last. And I have to hope that interaction is more than what’s shown on TV and in social media. This is an incomplete post in the sense that these thoughts and my experiences from this trip are still percolating. We’ll see what the future holds. I’m grateful for the opportunity to wind my way through West Virginia and to glimpse just a bit of its natural beauty. In early August I wrote about an experience on the road between Boston and Rhode Island, an experience that I described to people as being in the midst of a Klu Klux Klan rally where no one wore a hood. You can read that post here if you like. And though I wrote that post about my experience, my feelings in that moment, I also thought about what were the children in the neighboring cars experiencing, children of any race, what questions were they asking their parents and how were their parents responding. I especially thought that when I saw a little brown boy staring at the pickup truck in the lane next to him flying its huge confederate flags. I was surprised later to find so little commentary on local news and on the internet about that procession of thirty-plus vehicles in New England with their giant flags driving en masse along I-95. But I guess I was using the wrong search terms. I did not think to use the words: Make American Great Again Convoy, an event that took place July 30 and 31 in Foxboro, MA. I remember writing that I chose not to photograph anything around me that day on the road. But I do realize that it is important to capture the words and images of such events so that they can be documented and remembered. Since I wrote my original post a video has surfaced. When I first saw the still shots and read the transcripts of what people were saying that day on their CBs, I almost shrugged. I wasn’t surprised and my feelings were justified. Then I watched the video, listened to the words, and it made me want to cry. Not out of fear but out of sadness at what darkness remains in this world. As young white men laugh about lynching niggers from the nearby trees, using blacks as pinatas, I remembered the little brown boy staring into their trucks. And I thought of a young brown cousin who I’ve been told likes to chase Monarchs at his home in New York, and I thought of my young brown nephew who likes to plant gardens in his home in Virginia. They are too young to fear what has been because they don’t know that part of American history … yet. I thought of what these people must be teaching their children and I hoped that their children somehow would one day hold hands with children of all shades and know that they were the same. It is almost too easy to blame Trump and yet I do not want to let him and his brethren off the hook for what they have allowed to re-surface, unchecked, in this country. He was the spark for their tinder. The video is 4minutes and 45 seconds. It’s hard to listen to, and in no way kid friendly but it should be reflected upon because the sentiments expressed in the video and in similar gatherings online and in person across this country are not going to disappear overnight or anytime soon. Maybe never. However, somehow, there is always hope for better. One hundred thirty years later, I’d say we are a nation still being born. Burial places they certainly are, but across time, cemeteries have also served other functions within our communities — as gathering places for celebration, as gardens of serenity for reflection, as time capsules that help us remember and document the past. In the first of two posts, friend and guest contributor Donna Stenwall shares memories of her visits to cemeteries around the world, respecting their universal solemnity while experiencing the unique attributes of each place. It seems strange to say this, but cemeteries have always played a role in my life. The small New England town I grew up in is where it all began. One of my earliest memories is walking by the old cemetery on my way to the library. It was locked every day with the exception of July 4th. That’s when we were able to enter and roam the aisles of the chipped and weathered headstones of the residents that founded the town in the 1600’s. With the names and dates barely visible to the naked eye, this is where we were taught the art of stone rubbing. The “new cemetery” as we called it was the spot to learn how to ride your bike for the first time without training wheels. We would fly up and down the streets of the cemetery enjoying the freedom of 2 wheels, and all the while passing the graves of neighbors that left us too soon. Since Massachusetts still had Blue Laws at the time (meaning no shopping on Sunday), the place to take your first spin behind the wheel was the parking lot of the newly built mall on Sunday afternoons. There we got accustomed to the feel of the car, practicing forward and reverse and left and right hand turns. But, to practice that three-point turn on a hill that we would be tested on? It was back to the cemetery! When I began to travel, trips to cemeteries were on the itinerary. During my first trip to New Orleans I mentioned to our host that I would like to visit one of the old cemeteries I had heard so much about. The next day we set out to St. Louis Cemetery #3. It was there that I decided I wanted to be buried in a Mausoleum! Breathtakingly beautiful, I thanked our host for such an experience. It wasn’t until later I discovered that his mother was buried in St. Louis Cemetery and that our visit that day had been his first trip back since she had passed many years before. 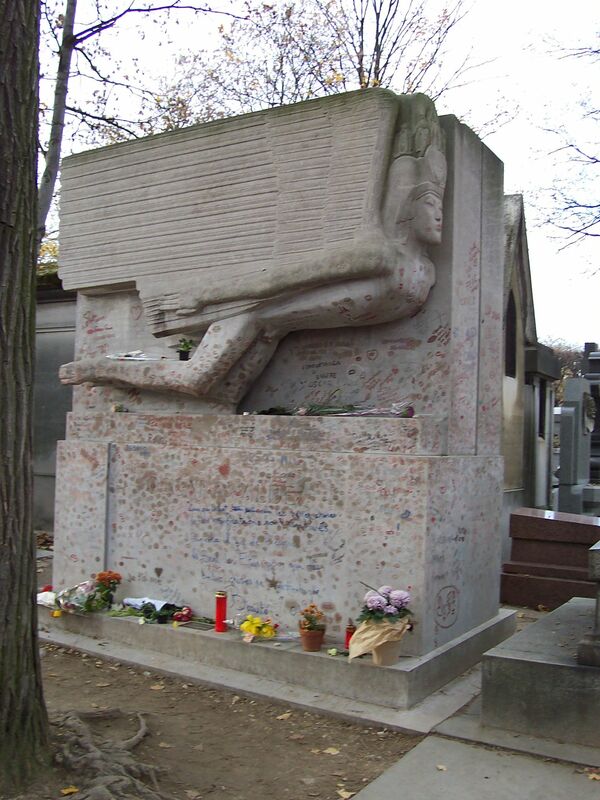 My first trip to Paris, with its famous cemetery Pere Lachaise, was long overdue and bittersweet. 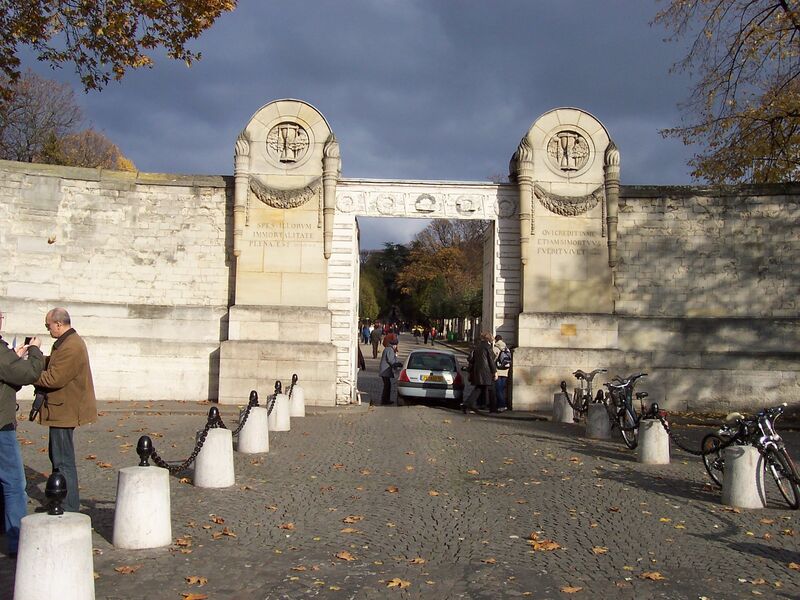 My husband and I had planned a trip to Paris several times but circumstances prevented us from ever getting there. With a smile and twinkle in his eye he promised that he would take me to Paris on my 50th birthday. Ah, I thought, the City of Lights I will see you soon! Heartbreakingly, my husband passed away on July 25, 2005 after a brief illness. Two months later, I celebrated my 48th birthday. When my 50th was approaching my dear friend suggested I think about Paris for my birthday. I wasn’t sure I could do it or even wanted to but with the urging of family and friends I made the trip. Paris was worth the wait and every step I took I knew my husband was with me cheering me on! 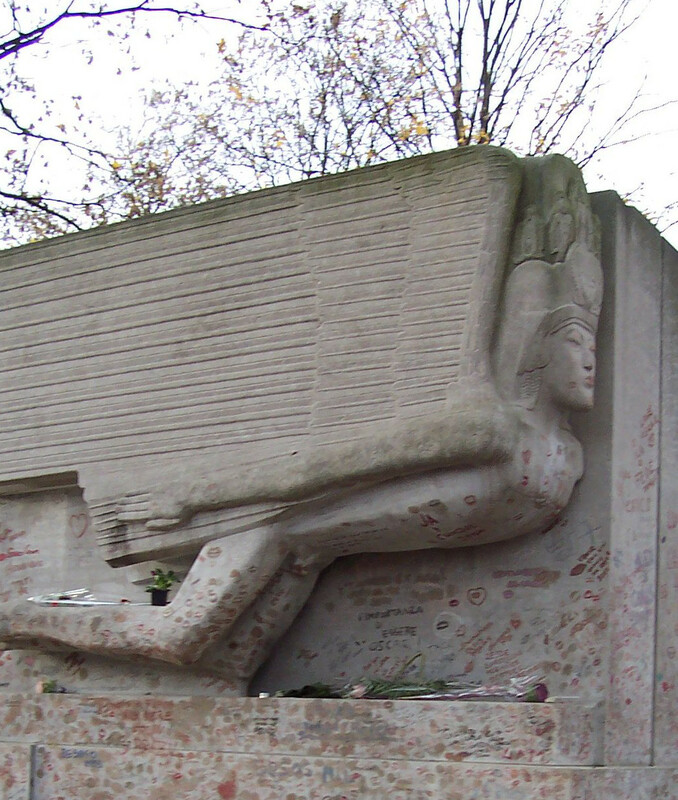 As a huge fan of Oscar Wilde, I knew I had to venture out to Pere Lachaise, the oldest cemetery in the city of Paris, to pay my respects. Not the easiest spot to get to, we hopped on the Metro, then a bus, and finally by foot. 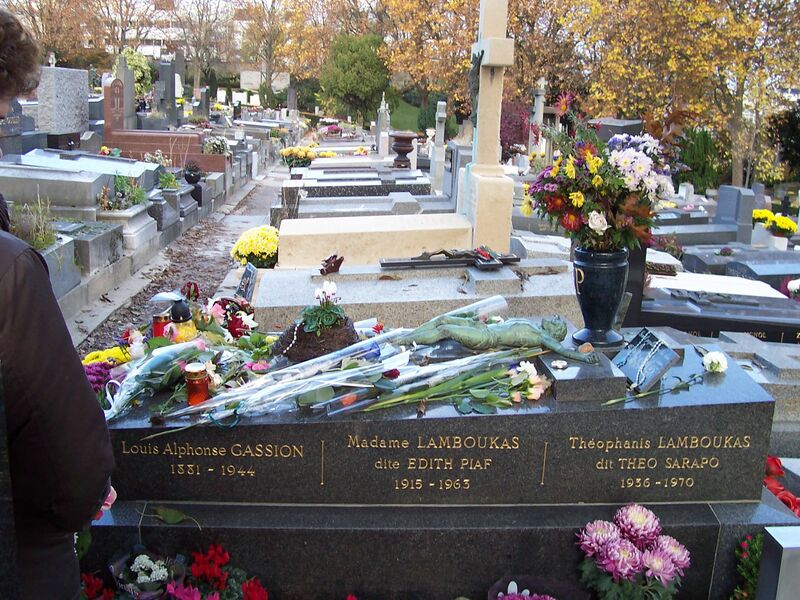 As we made our way to the other side of the cemetery we stopped to visit with Edith Piaf, Proust, Chopin, Colette, Sarah Bernhardt and Moliere. I noticed several people taking photos of the graves. I was a bit uncomfortable believing that these legendary souls were gawked at their entire lives and that now they should be allowed the peace they deserved. On our way to the exit it dawned on me that Jim Morrison of the Doors was buried here and we should find his grave. My friend humored me but after ½ hour of roaming (we were notoriously bad map readers), she was ready to give up. I told her to stay put and I would take 10 more minutes. If I didn’t find his grave we would head back to the apartment. As I was rounding the corner, there, right in front of me was Jim Morrison, surrounded by metal barriers and his own security guard. His grave was strewn with gifts of cigarette butts and empty bottles of Jack Daniels left by the pilgrims that made the trek. … in the waters of the pond below.